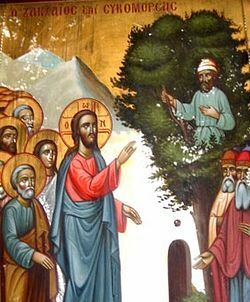 The 32nd Sunday after Pentecost in the Byzantine Rite is always Zacchaeus Sunday, the Gospel of the Poor Little Rich Man. It also is the unofficial beginning of the preparation season for Great Lent. What kind of a tree does Zacchaeus go up into? Who cares? Why doesn’t Luke just say, Zacchaeus climbed up into a tree? Sycamores are big trees, with a wide canopy of branches. Sycamores were introduced by King David, so though they are great shade trees in the desert, Jews looked on them as foreign. These particular sycamores grow a fruit like a fig, but if you wait until it falls off the tree, it cannot be eaten. So you have to go up and puncture the figs, pierce them with a rod shaped like a spear, in order to get the sweet fruit. The prophet Amos described himself as a dresser of sycamore trees : he was the one who would go and pierce the fruit. So Zacchaeus is an outsider among his own people, who climbs into a foreign tree, that has to be pierced with a spear in order to feed the people. There’s a lot happening in that simple phrase: he ran on ahead and climbed up into a sycamore tree to see him. When Jesus’ Heart is pierced on Good Friday, life came out of it in the form of blood and water. Zacchaeus is going to be pierced, not by a spear, but by Jesus’ very words. Why climb a tree? 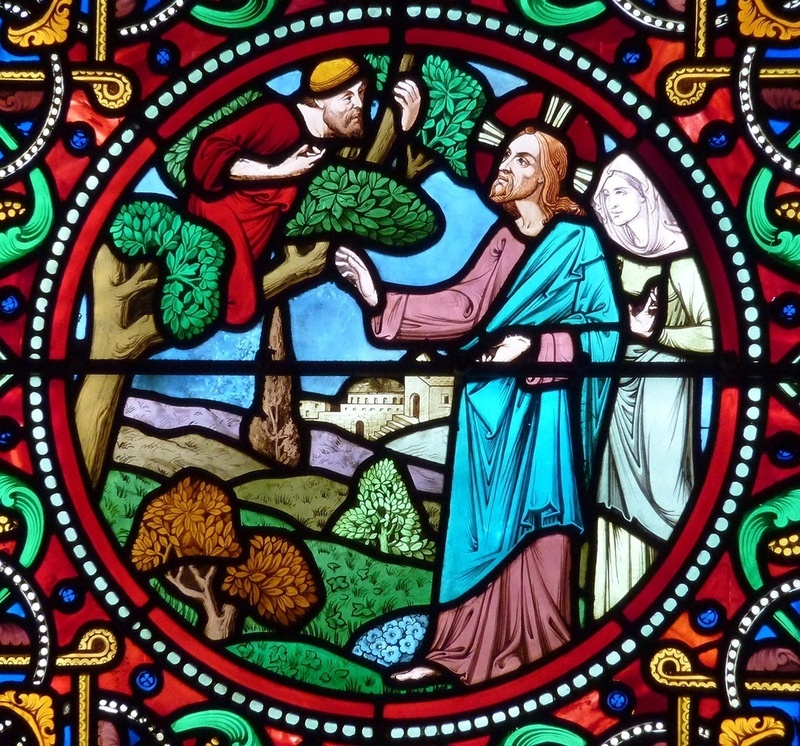 Zacchaeus is wealthy – it is surely beneath his dignity to go climbing in a tree, in his fine clothing. Behaving according to your status in life is very important in the Middle East, and even more so then. But he sought to see who Jesus was – desired, wanted to see this rabbi entering Jericho. This hunger for Christ drives him up into that oh-so-symbolic sycamore tree. He calls Zacchaeus by name – the Savior knows the sheep He has come to save. Jesus says make haste, hurry. There is no time to be wasted. Get down here because I am coming to be with you. Not just to visit, but to STAY, to remain in the house of this public sinner. Jesus says I MUST stay at your house – not I want. He MUST come into that house in order to save the members of that household, and there is no discussing the matter. The crowd “murmured” — I just bet they murmured. They had a lot to say about such a command. Why go there of all places? To him of all people? But the poor little rich man now has his own important words. Half of my goods I give to the poor – remember the rich young ruler in chapter 18? He was told by Jesus that if he was going to be saved he had to sell everything and give it to the poor, and then follow Christ. He went away sad because he had so many possessions and couldn’t do that. Zacchaeus says, I give half of my possessions to the poor – far more than required by any law of the time. “…. and if I have defrauded any one of anything, I restore it fourfold.” The Jewish Law required that a two-fold restoration of stolen property, or the full value plus one-fifth. Only in the book of Exodus was there a rule about making up a theft by paying four times the value, and that was for sheep. Zacchaeus is going to the maximum possible level required, to show that this conversion of his is a real one, and authentic. Jesus then says, “Today salvation has come to this house, since he also is a son of Abraham. In saying that, He reminds the crowd that Zacchaeus still belongs to the Jewish nation, that he has as much right to be saved as any other Jew. Now for us: How do I apply this Gospel to myself? Think of a behavior, an attitude, a bad habit that is deeply rooted inside of myself: it can be anything that is not a good practice, or habit, or behavior, something which I know has to be dug out and thrown away. Do I want to be saved? If our Lord was to step out of the tabernacle and walk up to me and say, Stop doing this and you will be saved – how attached am I to that practice, that behavior, that attitude, that sin? Because sin can become our normal, just as stealing and living in isolation became normal for tax collectors and their families. Christ says, Come to Me – I want to stay with you! You, no one else right now, but you! My answer would hopefully be as enthusiastic as Zacchaeus’ answer was. Yes, and I want to get rid of that sin. Here is the question: Do I want to get rid of that sin? Or has it become my abnormal normal? Sin is abnormal, but have I made it my normal? Zacchaeus could announce his conversion in public, and it must have lasted, or else Luke would not have put the story into his Gospel. We don’t have to do that, announce it for all to hear. But we must say it in confession to be forgiven, we must say it to God, we must acknowledge it in our own hearts – I want to dig this out and throw it away so that I can become closer to Christ. We had the Presentation of Christ in the Temple where He met His people: Simeon and Anna, who confirm to St. Joseph and Our Lady that their Child is indeed the Savior of the world. We must show Him who we are, which means opening the doors of our minds and hearts. Western society has made sin normal. I know priests who spend Saturday afternoon in the confessional reading their prayers, with only one or two people coming to confession. Here we have a line almost every Sunday, which is great. But this has to happen everywhere – we have to once again become a society in which sin is a tragedy, not a lifestyle choice, not something to be celebrated in movies and on the internet. Zacchaeus is going to change his entire lifestyle because Jesus called him by name and MUST stay with him. At Holy Communion, Father Artur says each person’s name, no matter how old or big or small – The servant of God N. receives the most holy precious Body and Blood of our Lord Jesus Christ for the remission of sins and life everlasting, Amen. I must be willing to be encountered by Christ, to meet Him, to let Him in, to be with Him here, to let Him pierce my own heart so that I can be healed by His Heart, so that when the time comes and He bids me to leave this life, I will do so to be with Him and the saints in glory, forever and ever. Amen. Christ is among us!